I was so excited when I saw the poster for the Footscray Vietnamese New Year Festival on the tram on my way home. 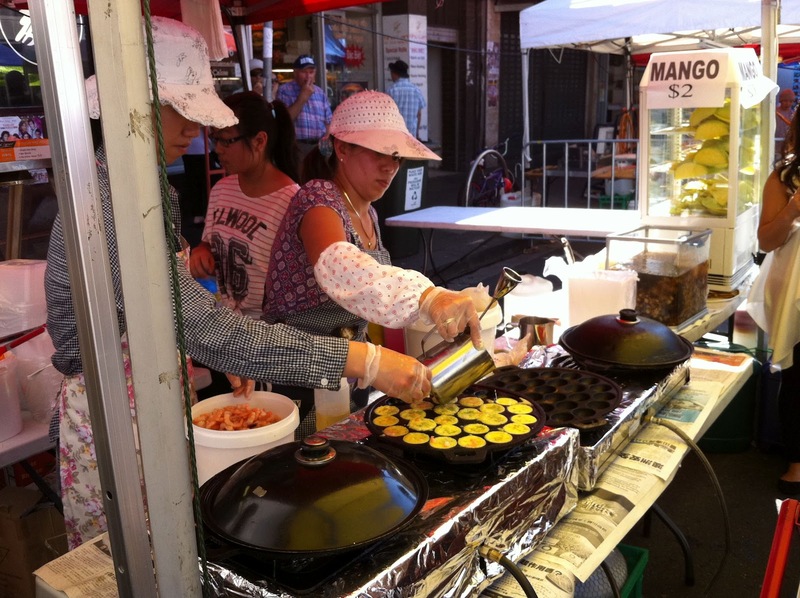 I was a bit sad that I missed the Richmond Festival the previous week but as I spend much more time in Footscray I would have been devastated if I'd missed that one. It was a scorchingly hot morning and Tina and I were both a bit tender after enjoying a few wines the previous evening with our guests but there was no way we were going to miss it so we dragged ourselves out of bed comforting ourselves with the thought of all the wonderful food we were about to gorge ourselves with. I had read that Leeds street and Hopkins street would be closed of and as it can be difficult to get a park in Footscray at the best of times we decided to catch the train. We arrived pretty early to ry and avoid the heat but this was futile as it must have been 30 degrees plus at 10 in the morning. The steaming heat combines with the smoky smell of all the wonderful food being fried, and grilled really made us fell like we were back in Vietnam. 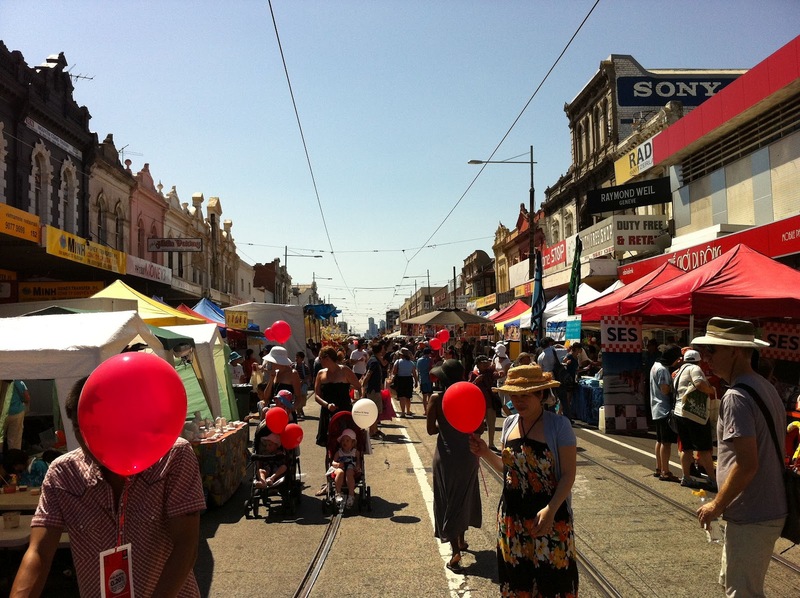 The Festival was really quite a grand affair, so much more impressive than our North Melbourne Spring Fling. Aside from all the wonderful food the carnies were out in force with all the games and rides and even a massive ferris wheel in the Little Saigon carpark. But we were there for a single purpose... food! 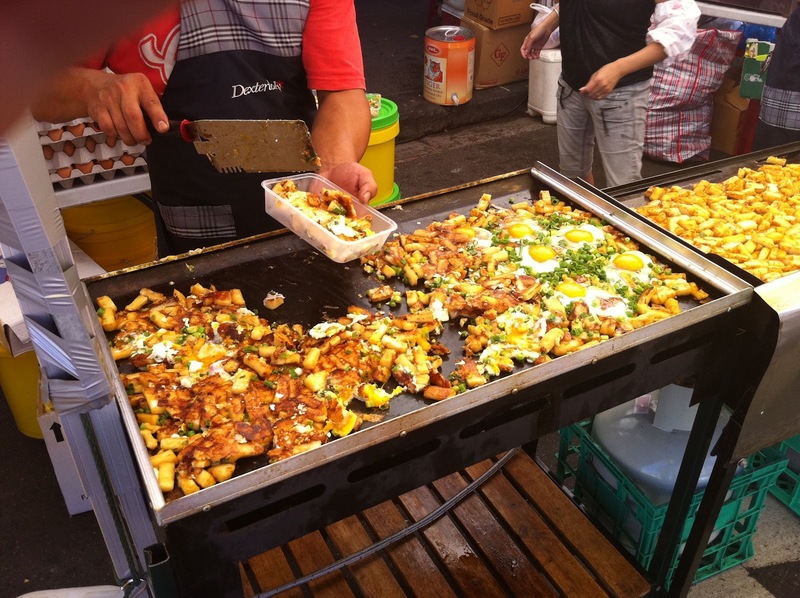 The first thing I saw was one of my absolute favourites, Banh Khot. These are delicious little mini fried cakes kind of similar to Banh Xeo (Vietnamese pancake). The best version is from Quan Viet in Braybrook. 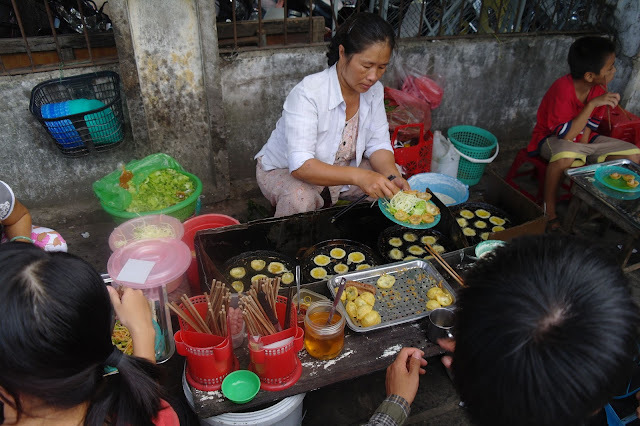 I was always a bit confused about these as I had them in Hoi An Vietnam (below) where they were called Banh Can Nem Cha (not Banh Canh which is a noodle soup), very confusing! I spoke to the lady who I get my coffee from as she is Vietnamese and she told me that it the same dish is sometimes called something different in different regions. Anyway, regardless of what they are called, they are delicious. They are pretty simple to make if you have the right pan, the batter is poured in and then a small prawn is added and the lid put on until they are cooked with lovely crispy edges. Then you just add some Nuoc Mam (Vietnamese dipping sauce) and stuff them into you mouth as quickly as possible. From memore these were $6, bargain! 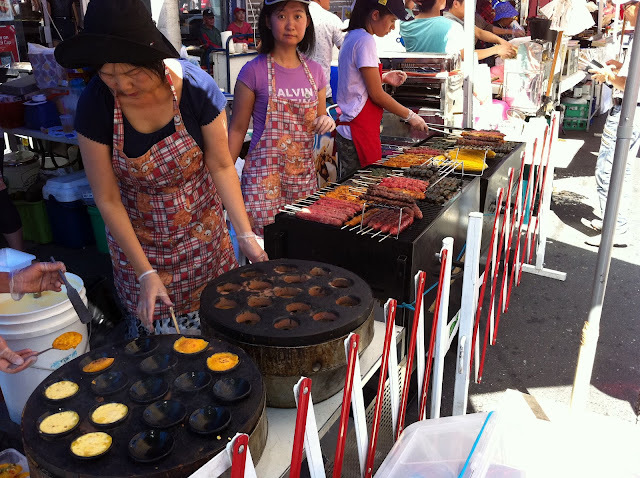 While we were waiting for our Banh Khot I noticed the same stall was setting up for Bot Chien, also $6, super bargain! 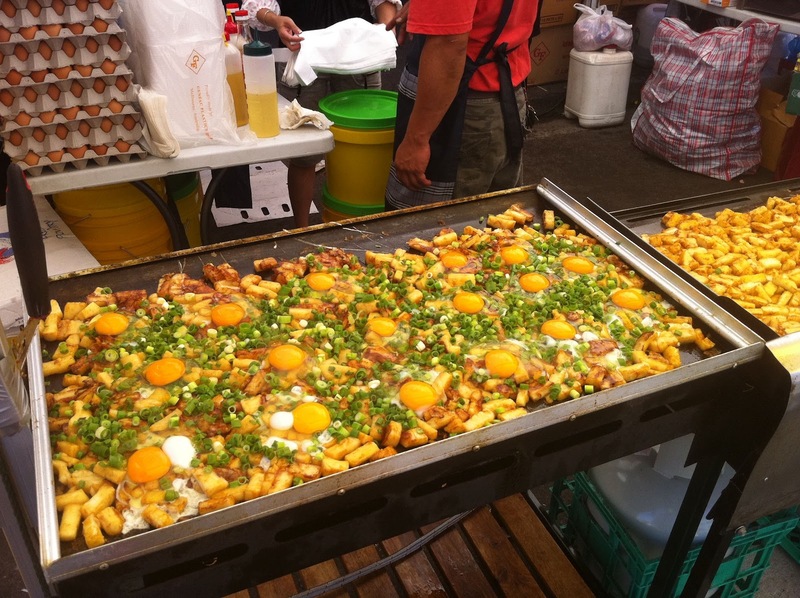 Bot Chien is another less common vietnamese dish made with steamed rice cakes cooked into a kind of omelette with egg and an amazing dipping sauce that is on my "I wish I had the recipe for this sauce" list. It is usually served with some shredded green papaya which adds a wonderful crunch but for me the sauce is what makes this dish so special. Please send the recipe if you have it, please!!! Just like a delicious work of art! Next it was time for something sweet. 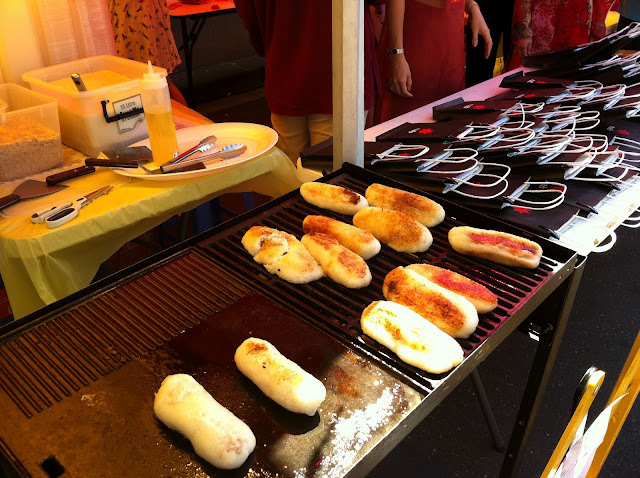 I spotted these awesome looking grilled lumps of sticky rice and after enquiring with the stall owner I learned that they were filled with a banana, brilliant! For $3 (mega bargain) I ordered a serve immediately. The stall owner chopped it into pieces then added a sweet coconut sauce with what I am guessing was tapioca pearls. This was fantastic, I have never had it before and have no idea what it's called but if you ever see it for sale, buy it. 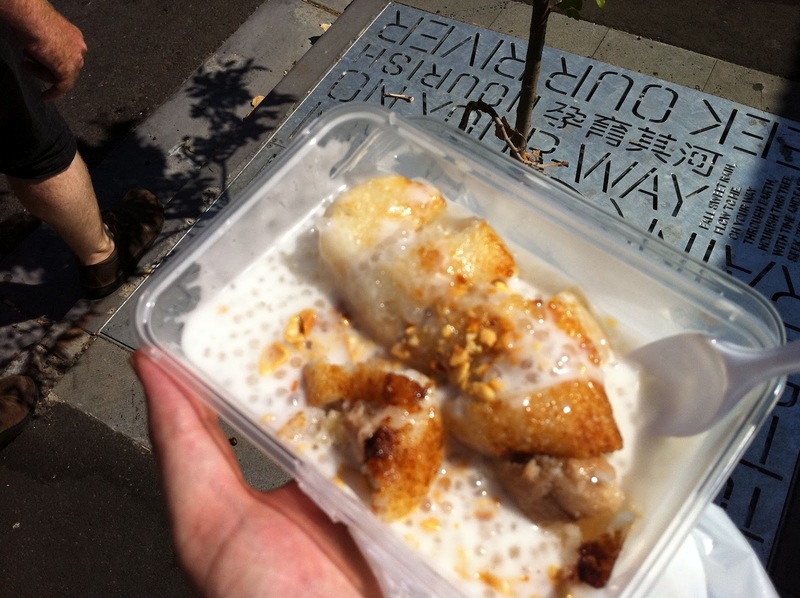 I don't know of any vietnamese restaurants that serve this so it looks like I'll be waiting until next year's Footscray festival until I get to enjoy it again. Charlie was starting to feel the heat by this stage, we all were actually. Sadly, while the Festival was really well organised with lots going on, there wasn't much seating and even less shaded seating so we found ourselves venturing out into the sun to get food and then retreating back to the shade to stand and enjoy it. As well as the many food vendors, there were also the usual local businesses handing out balloons and other showbags filled with promotional material. 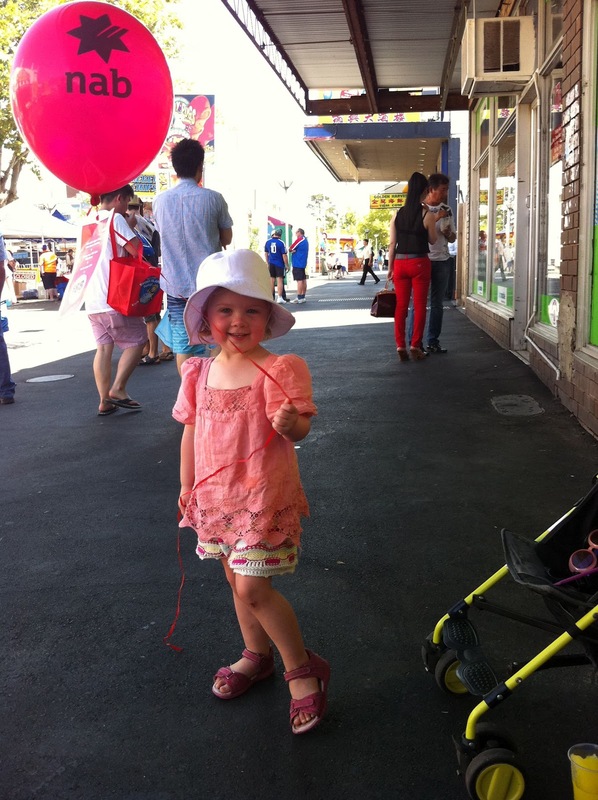 Charlie scored herself a helium ballon which kept her happy for long enough for us to search for more food, even though by this stage we were both uncomfortably full. It was a bit like the last day of an overseas holiday when you're rushing around trying to cram as much in as you can before you go home. There was quite a good variety of Vietnamese food on offer but I am always drawn to things that I haven't eaten before or food that is rarely seen on restaurant menu's so when I saw another different version of Banh Khot I had to try it. 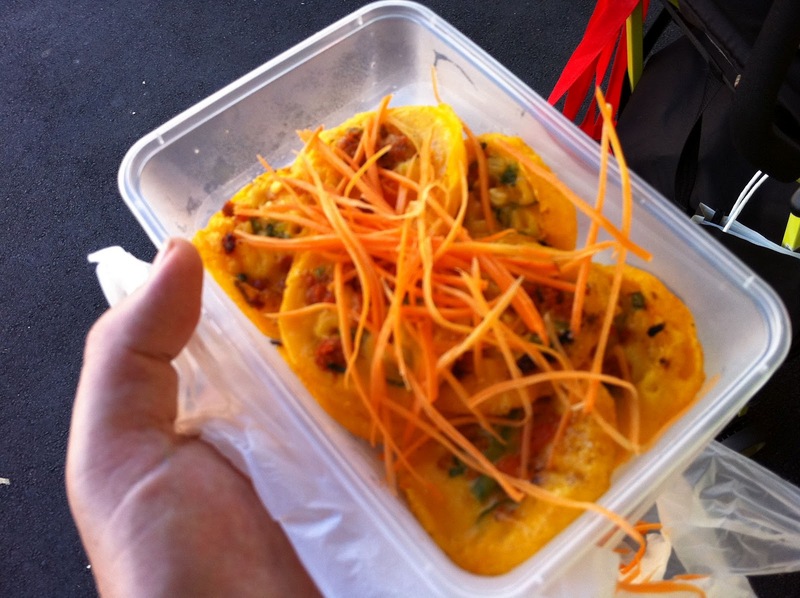 this one was definitely different to what I am used to as Banh Khot as the batter is more orange than the usual yellow and it contains more spring onion, no prawn and a few other things that I was too hot and too full to think about. It's also cooked on different equipment that is made of material similar to a claypot rather than the usual steel. I'm pretty sure these are cooked over charcoal too. Come to think about it, i'm actually not even sure they were Banh Khot. They were quite nice and perhaps if I wasn't so full by this stage I would have enjoyed them more but my vote goes to the first Banh Khot. I just can't go past the lovely crispiness of the batter combined with the indescribably superb taste sensation that is Nuoc Mam. Between Nuoc Man and Nam Prik I just can't decide, please don't make me choose. I love you both! By this stage we were totally done and ready to head home and crash out for an afternoon nap. Then I spotted something that brought back wonderful memories for me. 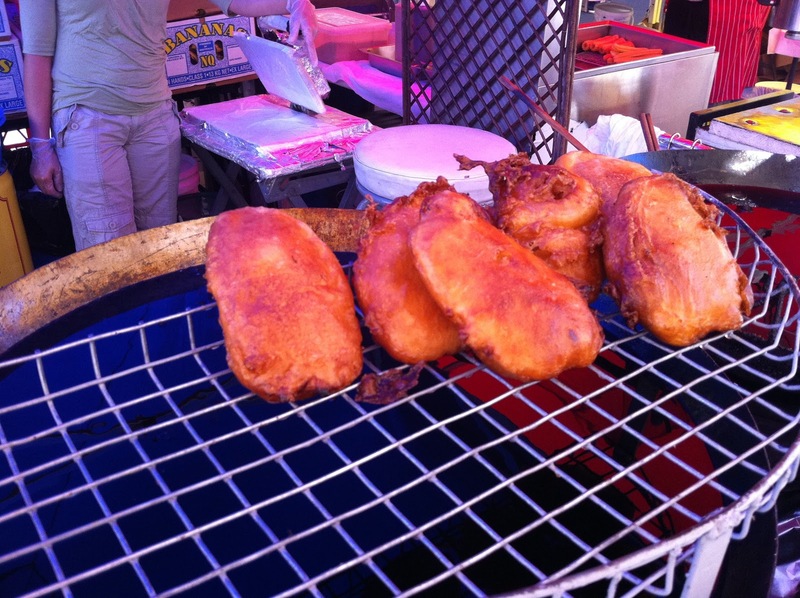 These are Vietnamese banane fritters and they are something special. When we were in Dalat Vietnam we spotted a lady sitting behind a large wok of oil over a charcoal burner. Next to her she had a tub of smooth creamy looking batter with a large spoon in it. Of course we had to find out what was going on and for probably 20 cents, we both ordered whatever she was making. It turned out to be sweet a banana batter that she dipped a large spoon in and then placed the spoon into the hot oil and carefully slid it out leaving behind a perfectly oval shape of the batter which then fried to delicious crispiness on the outside with a smooth custardy banana filling, amazing! It was then folded up in a piece of newspaper and handed to us. We ignored the pain of our burning mouths and immediately devoured it. So you can image how pleased I was to see these available in Melbourne looking exactly the same as what we enjoyed so much in Dalat. I own at least 10 Vietnamese cookbooks and none of them has a recipe for this dish, anyone? Footscray festival was pretty easily my food highlight of the year so far and its going to be hard to beat. Its so typical of Melbourne to make you think that you know a place, then have it reveal itself and show another wonderful layer that leaves you so pleased to be living in such a special city.